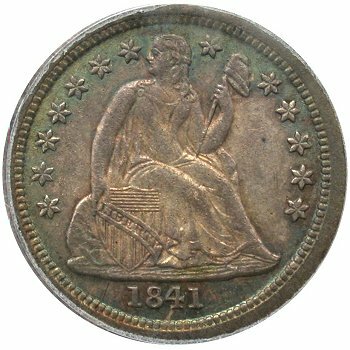 Comments: Obverse 1 was used to strike both Large and Small O transitional Closed Bud dimes in early 1841 and comes with a date punch that is positioned further left than the other obverse dies of that year. 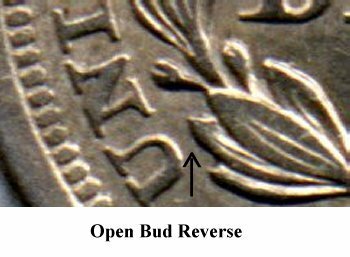 I am not aware of Obverse 1 being paired with Open Bud reverse dies. The obverse is well struck on the few high grade Closed Bud examples that exist. Reverse A is a left over reverse die from 1840. 1840-O Reverse (A) was previously shown to be in a late die state when paired with 1840-O Obverse 2 during its usage in 1840. 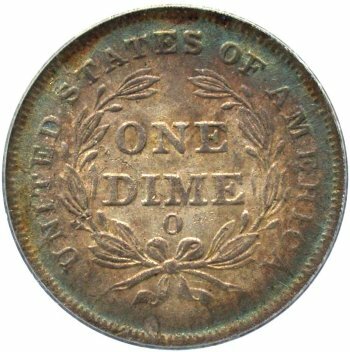 During the generation of coinage in early 1841, Reverse A die is well worn with numerous die cracks from the rim to the letters in the legend. 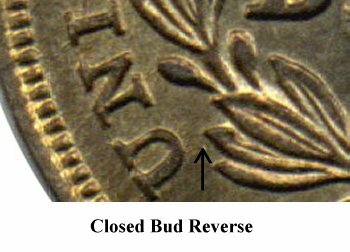 Cherrypicking examples of the Large or Small O Closed Bud can also be accomplished by studying either the obverse or the reverse die. 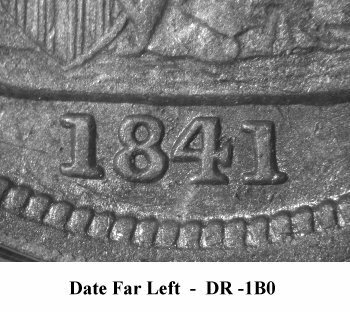 Since the same obverse die was only used with the transitional reverses, the date punch, which is farther left than on any other 1841 obverse, can be an important diagnostic. The differences between an Open and Closed Bud Reverse is obvious in higher grades. In lower grades, one must examine the position of the lower left wreath leaf with respect to (U)NITED. See the below photographs as a guide. 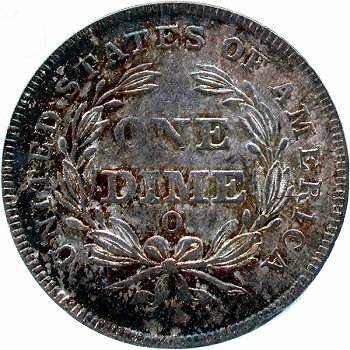 I consider both the Large and Small O Transitional Closed Bud dimes to be key entries in the Top 100 Liberty Seated Dime Variety set. Large O Close Bud dimes can be located in lower circulated grades between AG and VF. Most will be found with problems due to lengthy time in circulation. Obtaining problem free and original examples in EF or better will require a long term collecting horizon as few are known. Once obtained, these specimens will typical reside in an advanced seated coinage collection for multiple years. I am aware of only two TPG graded examples in AU holders. 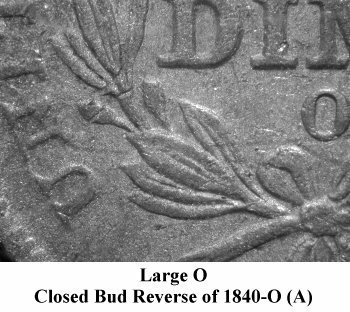 The plate coin is currently one of these two finest known examples of the 1841-O Large O Closed Bud transitional variety. There are no established pricing guides for the 1841-O Close Bud varieties other than the author's Top 100 Varieties pricing guide. Within the guide, AU50 examples are estimated at $20,000 while MS 60 grade is valued at $35,000. These price estimates are based on transaction knowledge of the two finest known AU specimens in PCGS holders within the past 15 years. Present valuation could be higher as more collectors adopt the Top 100 Varieties set as a collecting objective.